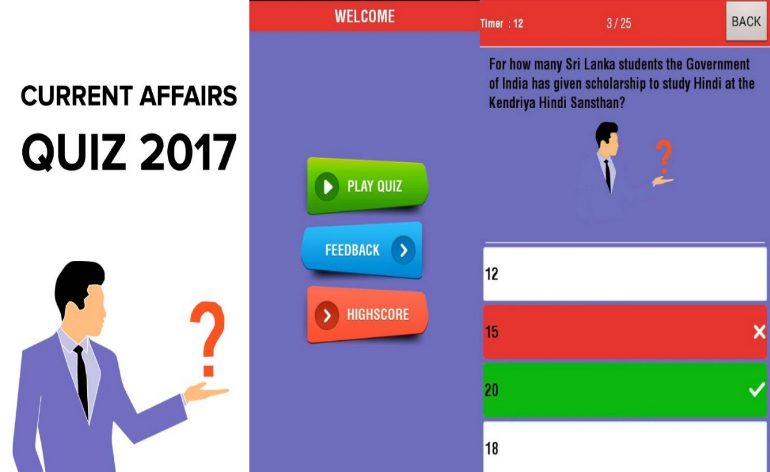 Daily Current Affairs GK Quiz is the most used & top rated Current Affairs app. India’s favourite way to learn Current Affairs for Bank, SSC, Railways, Civil Services, MBA exams in Hindi & English. Now master General Knowledge and Awareness anywhere, anytime. Get all the news on the move with its byte sized capsules. You can now catch up on all of the day’s most important events and updates in under 100 words so that you focus your efforts on only the most relevant Current Affairs Updates. Daily GK Current Affairs 2017 is the innovative named GK24 dedicated to daily current affairs for Bank, SSC, Railways, Civil Services, MBA exams in Hindi & English. Apart from latest current affairs it’s also cover complete General Knowledge and Awareness as Static GK, Indian History, Indian Economy, Indian Polity, Geography and general science. In our app, we have listed some brain storming recent GK questions where you score & challenge your friends to beat the same.This is the general knowledge questions and answers section on “Basic General Knowledge” with explanation for various interview, competitive examination. Download our app, learn and challenge your friends & families.